In New Delhi today (15 November 2011) Minister of State for Universities and Science, David Willetts, announced plans for a £10M joint call for sustainable bioenergy research between the UK and India. The call will support collaborative science which aims to solve shared problems in the production and processing of plants and algae for bioenergy, research that could help both nations develop sustainable alternatives to fossil fuels. The Minister said "International collaboration is vital to dealing with shared challenges. Utilising the expertise we have in both of our respective nations will be fundamental to the success of developing bioenergy as a sustainable alternative to fossil fuels and I am delighted that we will have the opportunity to work together to tackle this global issue." The call will be supported by funding from the UK Biotechnology and Biological Sciences Research Council (BBSRC) and the Indian Government Department of Biotechnology (DBT). 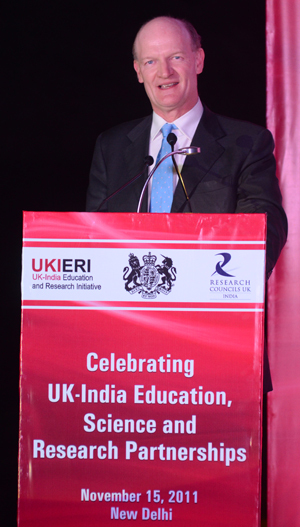 BBSRC will support the UK side of the collaborations while DBT will support the Indian side of the projects. The joint call follows a very successful workshop, held in New Delhi in October, where senior members of the UK and Indian bioenergy research communities met to discuss possible areas of collaboration. All of the projects funded by this call will have a UK and an Indian partner and researchers will be given funding to work closely with their international collaborators. Professor Douglas Kell, BBSRC Chief Executive, said "Plants have the capacity to provide alternatives to fossil fuels, not only for transport and energy but also to produce important chemicals and plastics. However, doing this sustainably, ethically and economically will require the application of scientific expertise from around the world. "India and the UK are countries with strong and complementary research communities and it is exciting to be able to harness the skills of researchers from both nations to address these important global challenges."